Every Filipino has a dream for a comfortable life, convenience from daily basic needs and penultimate intent to get rich. With the explosive era of growth in technology and internet in the Philippines, success through online means and achieving greater heights both professionally and financially are now within one's grasp. Just think out of the box and don’t limit your mindset with the stressful 8-to-5 employment and the life-sucking corporate job. Yes, the possibilities are now endless! One can do online entrepreneurship, a very easy way (thanks to Facebook) or join the recruitment program, being run by a referral system. Voila! Here’s the good news and a definite way to success! 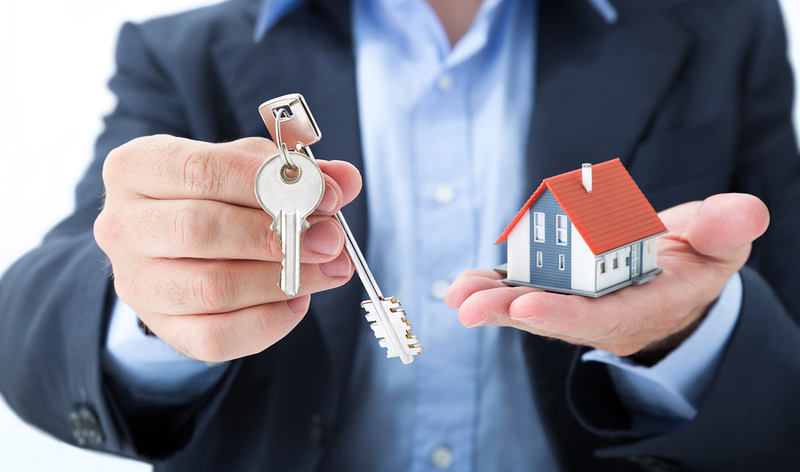 Recently, a real estate company offered an exciting opportunity for people to earn money. Young professionals or the millennials, students and those looking for a part-time job, read on, you’re on the right page. 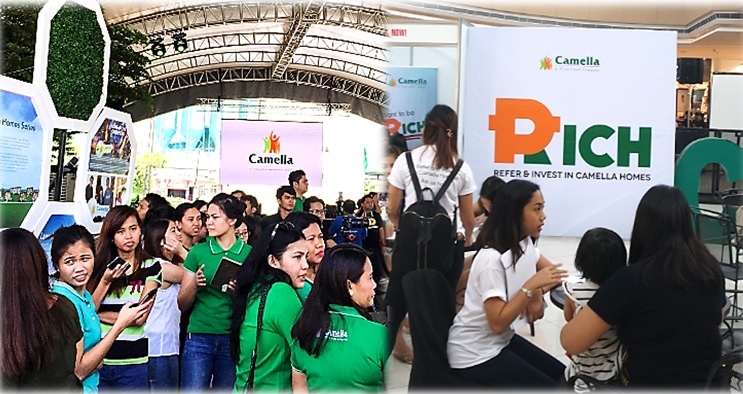 Camella, the flagship brand of Vista Land and Lifescapes, Inc., opened an avenue for a massive “RICH” referral program, which targets young professionals and adults who are keen on making extra income. This bold move of the developer is in line with their aggressive expansion this year and the shift towards a digitally-inclined business. RICH program was introduced at the National Camella Day last August 27. Photo by The Summit Express. The program was revealed during the company’s 40th milestone year anniversary celebration headed by the visionary businessman and former Senator Manny B. Villar. Filipino billionaire Manny B. Villar leads ribbon-cutting for Camella’s 40th anniversary celebration. While learning the ropes to get rich on this system requires motivation and perseverance, skills are also needed to be a good real estate agent. "The challenge now is for the brokers and even the licensed sales agents to expand their horizons. It is going to change in the next years to come on how we do business in real estate," Gelo Honorica, COO Southern Luzon explained. Camella South Luzon top officials (L-R) answer bloggers’ inquiries about RICH program: Gelo Honorica, COO Southern Luzon, Michael Carig, COO South Luzon, Jennifer dela Cruz, COO Camella Condohomes. How to get started? Get rich in two easy steps! One, get accredited now! 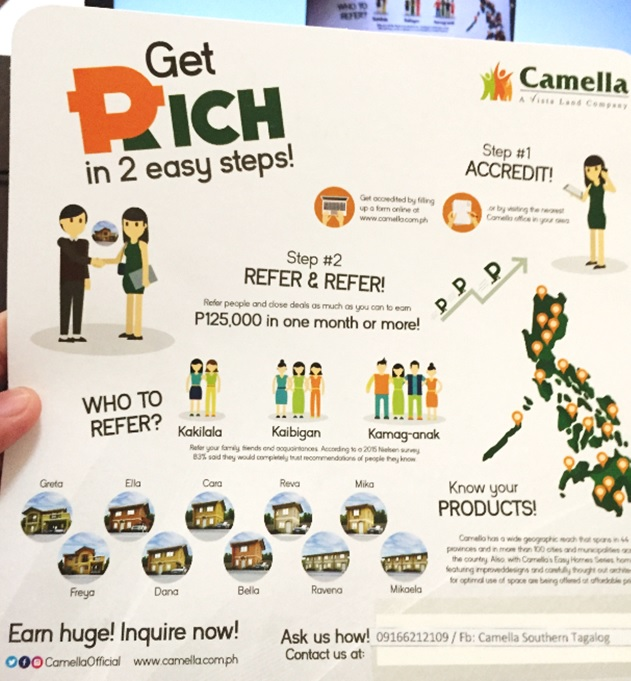 Fill up a form online at http://www.camella.com.ph/inquiries/sales-recruitment or visit the nearest Camella office in your area. Two, refer and refer! A Camella Sales Representative told us that the process is very simple: "Just your K.K.K. or Kakilala, Kamag-anak or Kaibigan. Ibigay n'yo lang ang pangalan at contact details nila, kami na ang bahala dun. Kami na tatawag para magbigay ng process at mag-ooffer ng Camella house sa kanila." Step 1: Get accredited! Fill up a form here (choose Referral Agents for the position you’re applying for) or visit the nearest Camella office in your area. Step 2: Refer and refer! Refer people around you, such as your family, friends, and acquaintances. Camella disclosed that commission rate is up to 2.5%. For instance, closing a deal with a client who decides to own a house model worth 5 million pesos, gets you a commission as much as P125,000. How to track earnings and payment? Account officers per area, who handle the buyer are also in-charge for the tracking of your earnings. You will get commission once the buyer paid the reservation fee and the remaining depends on the milestone up to the full payment. Camella is the largest homebuilder in the Philippine real estate industry.With 40 years and counting, the brand has already built more than 400,000 homes in 45 provinces, and more than 120 cities and municipalities across the country. Masterplanned community in Taguig by Camella Homes. Photo by The Summit Express. Camella, a Vista Land company gives upgraded lifestyle radiating the comfort and convenience of urban living.